A small typographical error in a letter or proposal reflects poorly on your organization. It can often result in a potential customer, supplier, or partner deciding not to work with you. Effective proofreading by you and your team members is critical. As a manager and team leader, your ability to proofread not only your work, but also the work of your team members is essential in helping create a positive perception of your organization. But any employee who generates written communications must demonstrate agile proofreading skills. Today, email is ubiquitous and is the preferred method of contact for many. Whether the communication is internal or external, and regardless of its format—printed newsletter, email, or posting on the Web—overlooked errors can damage an organization’s credibility. 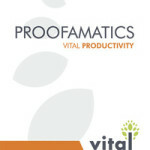 The Vital Learning Proofamatics™ course helps employees improve accuracy in written communication by equipping each participant with improved proofreading skills. It highlights the errors most commonly made in written communications and provides a system for finding them.